System Development Life Cycle means all the steps and phases that are needed to translate a real-world System and it's overall System activities into a computerized system. 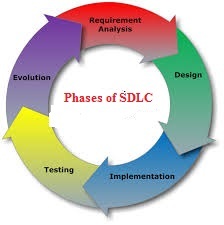 A new phase of SDLC starts only when it's initial phase is completed. Studying the ability to propose alternative solutions after meeting with clients, suppliers, consultants, and employees. Studying how to make your product better than your competitors. After analyzing this data, you will have three choices: develop a new system, improve the current system or leave the system as it is. The feasibility study is an important phase of SDLC. In this phase, we study that whether or not the project is beneficial/possible or worthy if it can be implemented, given the existing budget and schedule. A feasibility study is the total of the actions you take and the questions you ask to determine whether an idea, thought or plan is likely to succeed. An effective study can guide you on whether you should move forward with your project, refine it or leave it. In the analysis phase the end user’s requirements, need to be determined and documented, what their expectations are for the system, and how it will perform. The objective of the Analysis phase is to define in more detail the system inputs, processes, outputs, and interfaces. At the end of this phase, the system’s processes will be defined at the functional level, meaning the functions to be performed will be known. Requirement Engineering phase actually defines all the components of software. In this phase the question “How the developed software looks like and what function it will do?” is answered. In systems design, the design functions and operations are described in detail, including screen layouts, business rules, process diagrams and other documentation. In the Design phase, the functions of parts of a software system are designed by using flowcharts (diagrammatic representation of a computer program), algorithms (set of steps to perform a task) etc. The main aim of the Design phase is to facilitate the coding process. Once the design is complete, most of the major decisions about the system have been made. The goal of the coding phase is to translate the design of the system into code in a given programming language. This code is written is a formal language called a programming language. For a given design, the aim of this phase is to implement the design in the best possible manner. Software testing is a process that should be done during the development process. In other words, software testing is a verification and validation process. Keeping the system in its proper working condition is called maintenance. In other words, it can be defined as the modification of a software product after delivery to correct faults and to improve performance. Maintenance process continues until a complete solution is provided to the customer.